Epiphone presents the Ltd. Ed. EL-00 PRO Mahogany Acoustic Electric, available in two exclusive color finishes—beautiful Mahogany and Vintage Sunburst. Only at select Epiphone Retailers! The Epiphone Ltd. Ed. EL-00 PRO Mahogany Acoustic/Electric is a new addition to the classic line of flattops that can trace its roots back to the first golden age of Epiphone in the 1930s. Plus, the modern Ltd. Ed. EL-00 PRO Mahogany features the state of the art Fishman™ Sonitone™ and Sonicore™ System pickup system, a perfect compliment to a vintage style Mahogany top. The smaller "parlor" or "blues box" style acoustic guitar is favored by blues players of all eras for its woody tonal quality, short scale, and comfortable weight which makes it ideal for fingerpicking or the bark of a bottle neck slide. And the new Ltd. Ed. EL-00 PRO Mahogany not only features the warm, expressive sound of a Mahogany top but now you can plug in with the Fishman™ Sonitone™ soundhole preamp and Fishman™ Sonicore™ system for pro acoustic/electric sound. The Ltd. Ed. EL-00 PRO Mahogany Acoustic/Electric from Epiphone carries a Limited Lifetime Warranty and features Gibson's 24/7/365 Customer Service that guarantees your blues machine against defects in materials or workmanship. The Ltd. Ed. EL-00 PRO Mahogany is available for a limited time only. Contact your select Authorized Epiphone Dealer and play the guitarist’s best friend, the one and only Epiphone Ltd. Ed. EL-00 Mahogany PRO Acoustic/Electric. The Epiphone Ltd. Ed. EL-00 PRO Mahogany Acoustic/Electric features a Solid Mahogany top with 3-ply Ivory and Black color binding and is available in a classic Mahogany finish or Vintage Sunburst. Mahogany has long been a favored “tonewood” and is revered for its ability to sound “played in” from the first note. 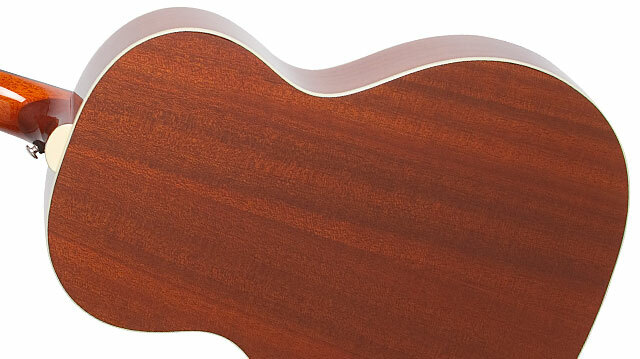 The EL-00 body features select Mahogany with elegant single-ply Ivory binding on the back. The combination of using select Mahogany for the neck and body along with a Mahogany top gives the Ltd. EL-00 PRO Mahogany a tone you might think could only come from a guitar that’s been played for decades. The smaller body (15.5" wide at lower bout) and straight bridge also influence the EL-00 PRO's unique tone, which is slightly warmer and less forward than a dreadnought and is perfect for both solo singers and even slide guitar. The 24.75" scale select Mahogany neck has a SlimTaper™ "D" profile with a 1.68" imitation bone nut and is set with a hand-fitted dovetail neck joint using premium Titebond™ glue. The Rosewood fingerboard has a 12" radius, 19 medium frets, and pearloid dot inlays. The classic “Tortoise” style pickguard has a vintage metal "E" and the straight bridge also features a compensated, imitation bone saddle like Epiphone’s acclaimed Masterbilt series. Epiphone is proud to re-introduce the Ltd. Ed. Epiphone EL-00 PRO Mahogany Acoustic/Electric with the superb Fishman™ Sonitone™ preamp and Fishman Sonicore™ pickup system. Fishman™ is an industry leader in bringing a guitar’s true acoustic tone to bigger stages. 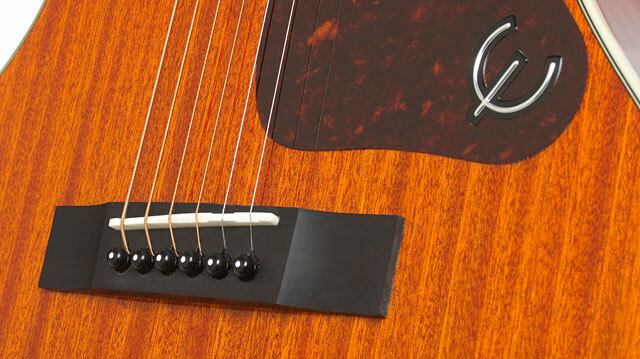 The Sonicore™ pickup is set underneath the saddle. The Sonitone™ sound-hole preamp is an active preamp mounted in the soundhole with easy-to-access mounted rotary controls for Master Volume and Tone adjustment. Now you can make your adjustments during soundcheck and even fine adjustments on-the-fly during your set. No more running back and forth to your amp or the soundboard! Finally, your tone is in your hands right where you need it. A single 9-volt battery powers the active preamp. And you can connect your Epiphone Ltd. Ed. EL-00 PRO Mahogany to a PA or amp of your choice with a standard ¼” instrument cable. Batteries typically last up to 100 hours. The Epiphone Ltd. Ed. EL-00 PRO Mahogany Acoustic/Electric features Epiphone's world famous solid nickel hardware including a heavy duty ¼” output jack and strap buttons along with legendary Grover® mini-Rotomatic machine heads with 14:1 ratio tuners. The Ltd. Ed. EL-00 PRO Mahogany is set up at the Epiphone factory with legendary D’Addario Phosphor (12-53) strings.